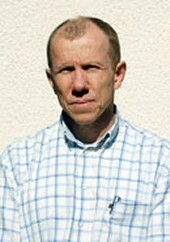 Phil was raised and educated in Rhodesia/Zimbabwe, gaining a veterinary degree at the University of Zimbabwe in 1987. He worked in a predominantly cattle and equine practice in the Eastern part of Zimbabwe before taking time out to visit India, Nepal and Pakistan. He arrived in the UK very much lighter in weight and finances. Job hunting for a mixed practice brought him to Bridgend in October 1992. 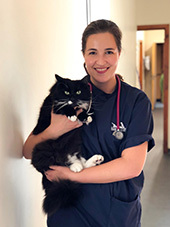 Sarah qualified from the School of Veterinary Science at the University of Bristol in 2002 and took up a job in Bridgend soon after for what was originally intended to be just a couple of years. Over ten years later she is still here and bought into the practice in 2012. 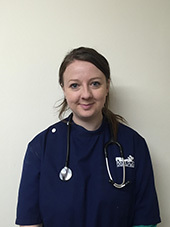 Having enjoyed the daily variety of mixed practice for fifteen years, Sarah has now moved wholly into small animal work but still has wide ranging clinical interests including ophthalmology, backyard poultry, wound management and more recently, geriatric medicine and brachycephalic surgery. She keeps cats and a small flock of chickens and outside of work is usually found in the vegetable garden, up in the Brecon Beacons or in her hammock with a good book. Rhian Matthews first graduated with a BSc Hons in genetics and bichemistry from Cardiff University in 2006. 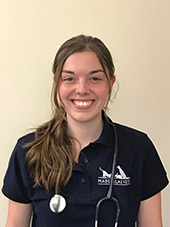 After working for a large local dairy farm and then a beef and sheep station in New Zealand she decided to return to university to study veterinary medicine, graduated from the Royal Veterinary College in 2011 and started with Maes Glas two days later. Rhian is well known in the area due to her agricultural background and has also been an active member of the Glamorgan Young Farmers Federation since a tender age. She enjoys all aspects of mixed practice but unsurprisingly dedicates most of her time to farm and equine work. She is a certified DairyCo Mastitis Control Plan Advisor and a Welsh Lamb and Beef Herd Health Planner and also works very closely with our Farming Connect Advisor for the area to organise local on-farm events and farmer information evenings. Emma graduated from the University of Bristol in 2005 and spent three years working in a busy mixed practice in Leicestershire. She then went travelling for ten months around South America, Australia, New Zealand and Asia before returning to the UK as a locum vet. 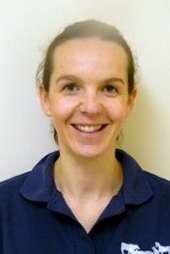 After locuming for Maes Glas for a month in 2009 she joined the practice permanently in October of that year. 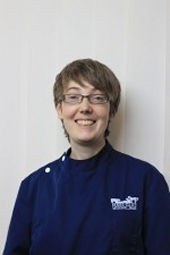 Emma mainly works in the Bridgend and the Porthcawl branches and she has a particular interest in small animal surgery. In her spare time she enjoys walking her dog, visiting local beaches and the Brecon Beacons, snowboarding holidays and horseriding. Daniela graduated in 2012 from the University of Evora, in Portugal, and has worked in small animal practice since. In 2015 she moved to the UK in order to further develop her interest in small animal internal medicine. Daniela loves all furry creatures but has a particularly soft spot for cats. In her spare time, Daniela loves to travel, eat nice food and watch good movies - she misses the Portugese sunshine but enjoys working in Wales and developing her medical and diagnostic skills. Jade graduated from the Royal Veterinary College in 2016. Originally from Swansea she is delighted to return home to practice veterinary surgery in South Wales and become part of the Maes Glas team! 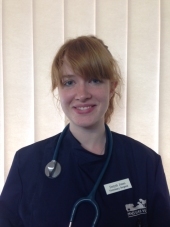 Jade enjoys all aspects of small animal medicine but has a particular interest in cardiology. Growing up helping out on a friend’s farm also sparked her enthusiasm for large animal work, particularly herd health management. In her spare time she enjoys travelling, socialising with friends and spending time with her mischievous Jack Russell, Toby. Lluís graduated in 2015 from the University of Santiago de Compostela, in Spain. He also did an Erasmus year in the Freire Universität of Berlin, in Germany and is fluent in a number of languages. He has worked in small animal practice since 2015, starting in the sunny island of Mallorca, where he was born. 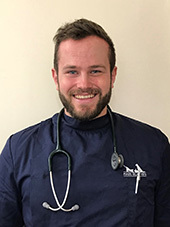 In 2017 he moved to the UK looking to develop his skills in small animal internal medicine. In his spare time, Lluís loves to travel, read Science fiction books and watch horror movies. He misses his dog, Dujal, who still lives in Mallorca, but he loves Wales and the Welsh people. Candice graduated from London in 2006. Wanting to be close to her family and friends she returned to the area to start her first job as a mixed animal vet with Maes Glas. After 4 years Candice went on to develop her interest in small animal medicine and now leads the small animal medicine team in our Bridgend surgery. 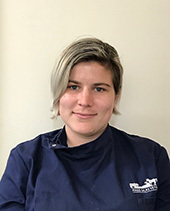 Candice prides herself in making sure that all pets receive the highest standard of care during their stay with us and is working towards a certificate in small animal medicine. 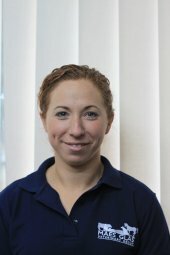 She has taken postgraduate courses in endoscopy, cardiac and abdominal ultrasound, oncology and local anaesthetic techniques in addition to spending time in a number of referral hospitals gaining experience, all of which enables her to provide a full range of diagnostic and treatment options. Outside of work Candice enjoys riding her horse Patrick, walking her dogs Dolly and Toby and of course socialising, shopping and watching the rugby! Sara graduated from the university of Santiago de Compostela in 2016, before moving to the UK to pursue an internship in Leeds. Later that year she moved to Wales to start work in a small animal practice. After two years there, Sara joined Maes Glas in October with the aim of pursuing her interests in emergency medicine and diagnostic imaging. During her university days, Sara volunteered with an animal rescue centre in her university town of Lugo and enjoyed her mixed animal holiday placements. These days she enjoys horse riding and getting to know Wales as well as travelling more globally. She doesn’t mind the mild welsh weather but does miss her rescue pets and family back home. When the time is right, Sara is looking forward to expanding her family..... with a kitten! Sarah graduated from the University of Cambridge in 2004 with degrees in Veterinary Science and Biotechnology. After a stint in practice she worked in a variety of other industries including biotechnology, financial services and a technology start up before returning to clinical practice. Sarah’s main clinical interests lie in canine sports medicine, rehabilitation and chronic pain management, especially in older patients. She also loves rabbits and other small furries. Outside of work Sarah enjoys canicross, bikejor and agility with her dogs and trial running, kitesurfing, wakeboarding and mountain biking without them. 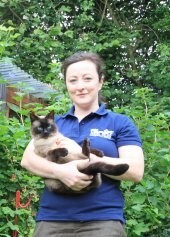 Sara has worked at Maes Glas since qualifying from the Royal Veterinary College in London in 2004 and now concentrates on small animals, working mainly in our Barry branch. Her clinical interests are soft tissue surgery, small animal medicine and also acupuncture. Outside of work, Sara's interests are running, house renovations, growing vegetables in her allotment and being kept busy with her two small children! 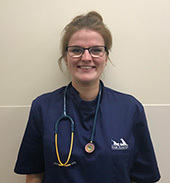 Lottie graduated from The University of Edinburgh in 2012, and worked as a mixed vet for two and a half years in her home county of Yorkshire, before going travelling to South America for 3 months. After her return, she worked as a small animal locum, eventually moving to Wales in 2016. 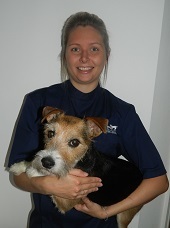 Lottie enjoys all aspects of small animal work but is particularly interested in small animal and wildlife medicine. As well as being a massive rugby union fan, Lottie's other hobbies include skiing, netball, hill walking and she harbours an ambition to take advantage of the beautiful Welsh coast and get back into sailing. 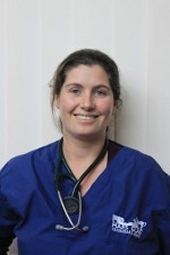 Emma graduated from the Royal Vet College in 1996 and joined Maes Glas later that year for a 2 year stint. Following this, Emma left to see the world and after working in a variety of practices both in the UK and down under, returned to Wales in 2000 to marry Phil. She has worked in small animal practice since then. After taking a break to start a family, Emma now works for Maes Glas part time and when she is not at work (or running around after the children) enjoys walking her dog, gardening and classical singing. Rob graduated from the Royal Veterinary College, London in 2013. 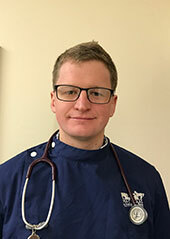 Having started his career in farm and then mixed practice, Rob now enjoys the variety of small animal first opinion practice. When not consulting or in theatre he is often found in the practice library keeping his knowledge up to date so he can offer the best he can for the patients in his care. Rob is a budding apiculturist and, having moved from Devon to Wales with his bees, is already looking forward to tasting some Welsh honey! Bleddyn joined Maes Glas in 2012 immediately after graduating from the University of Bristol. 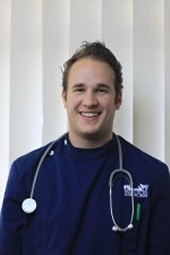 Originally from Pontyclun he began to see practice with us at the age of 16. His parents own a show kennel of Newfoundlands, perhaps leading him to develop his interest in small animal surgery. Away from work Bleddyn is a keen football player and ice hockey fan. Hollie graduated from the University of Liverpool in 2017. She is originally from Worcestershire and decided after University to move away from the North and closer to home. Hollie is excited to be able to develop her interests in both small animal surgery and medicine, particularly cardiology. Outside of work Hollie enjoys traveling the world and swimming. She is also looking forward to exploring the beautiful Welsh countryside with her dogs; Merlin and Oz. Jade graduated from the University of Liverpool in 2018. She enjoys all aspects of small animal medicine, particularly ophthalmology and ferret medicine! She has also developed an interest in oncology and dermatology. Originally from Somerset, she is looking forward to exploring south wales and has crossed the bridge in the company of her beloved pet ferret, Bugsy. In her spare time she enjoys reading, swimming, walking and trying to keep Bugsy out of mischief. Delyth joined Maes Glas after graduating from the University of Liverpool in July 2014. 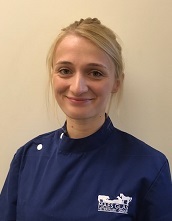 Originally from Mid Wales and a native Welsh speaker, she grew up on a sheep and beef farm and has an interest in all aspects of mixed practice especially small animal surgery. 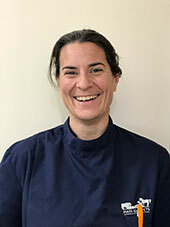 Prior to pursuing her veterinary calling, Delyth enjoyed working as a receptionist and nurse at a practice near her home and also worked on a Dairy farm in Devon. In her spare time Delyth enjoys travelling, reading, shopping and jogging with her little collie Pip. Delyth will be taking some time off from the end of 2016 to have her first child and we wish her all the best. Cristian graduated from USAMV- Faculty of Veterinary Medicine in Timisoara in May 2010 and two years later finished his Master’s degree. Originally from Romania, he decided to come to the UK in 2012 having completed one and a half years of experience in a farm practice. 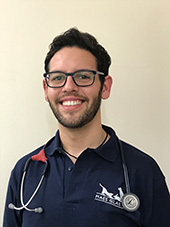 Cristian has a special interest in surgery and joined our team in November 2018. In his spare time, Cristian spends time with his family, likes to travel, playing the guitar and developing his knowledge in different aspects of life and the surroundings. 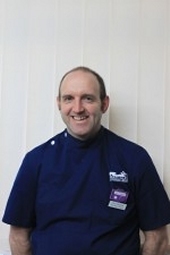 Clive qualified from Dublin in 1996, he enjoys small animal medicine and surgery especially. Being from a farm background he also enjoys getting out to do some farm animal practice. Outside work he is a keen Munster and Ireland rugby fan and long suffering Liverpool supporter. Otherwise he is kept busy with 2 young kids and getting back to Ireland to see his family and friends and to enjoy occasional pint of Guinness! 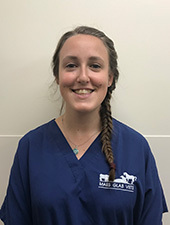 Elena graduated from the University of Bristol in 2018 and joined Maes Glas Vets shortly afterwards. 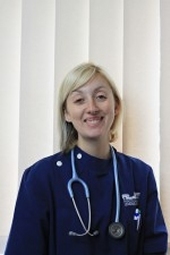 She enjoys all aspects of small animal practice, particularly medicine, cardiology and clinical pathology. Elena also has a keen interest in animal behavior and completed an additional "intercalated" degree in Animal Behaviour and Welfare in 2017. Born and raised in Geneva, Switzerland, Elena still visits home regularly – particularly during the ski season! She also enjoys hiking, running, and taking advantage of the Welsh coast through surfing and windsurfing. Her other hobbies include reading, playing the piano and baking (sometimes bringing the more successful results to work). Will graduated from the University of Nottingham in 2018. 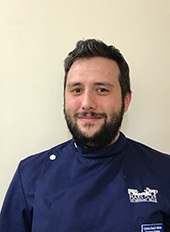 He enjoys all aspects of clinical practice but has developed a particularly keen interest in surgery and emergency medicine. Outside of work, Will can be found on the rugby pitch most weekends, having gone native and joined a local team. When not playing rugby, Will is an enthusiastic surfer and also enjoys exploring the Brecon Beacons. Emily graduated from the University of Liverpool in 2018. Originally from Essex, she opted for a complete change of scenery and relocated to beautiful south Wales. Outside of work Emily enjoys going to the gym, running and exploring the amazing countryside. Much of her spare time is spent looking after her fabulous pet rats, who live like kings!